More than 240 teens enrolled in the International Baccalaureate (IB) Diploma Programme (DP) are scheduled to descend on Segovia July 1, in advance of the opening of the first-ever IB World Student Conference. One of two IB conferences to be held this July, the Segovia event, located on the IE University campus, provides a venue for extracurricular learning in a collaborative environment amidst like-minded youth eager to dive into a rich intercultural experience with their peers. The teens will participate in five days of chaperoned activities that support examination of global engagement through social entrepreneurship, and which enable them to advance their personal Creativity, Action and Service (CAS) projects, a prerequisite to earning the IB Diploma. All registrants, aged 15-17, are enrolled in the IB Diploma Programme; conference participants hail from dozens of countries, from Spain and as far away as Australia, Canada, China, France, India, Japan, Mexico, Singapore, the Netherlands, the United States, and the United Kingdom.. 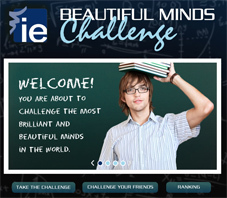 The IB World Student Conference at IE University runs from July 2-6. During their week on the IE campus, a magnificent convent from the XV Century, conference-goers will devise innovative action plans to tackle the world’s most pressing problems. They will work in Global Action Teams to advance grass-roots social entrepreneurship projects that focus on Culture, Ecology, Social Justice, and Sports. How is it to start a new life? Do internships add value to your BA Degree? Is Psychology relevant in today’s job market?